Almost a year ago, I was in Fairhope, Ala. and found a delightful new style of cup and saucer I learned is called a "tea and biscuit set." It was the first time I'd seen this type of teaware which featured a small oval plate and matching cup, slightly larger than a normal cup and saucer but nowhere near as large as a tea and toast set. 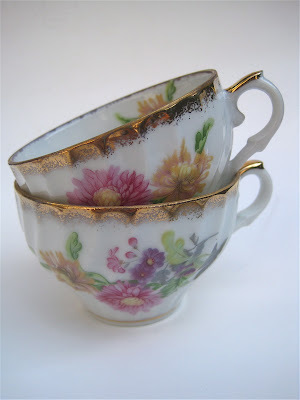 The tea and biscuit set I own is shown here, and the one in the photo above was actually a recent find for my friend Sandra's birthday, which was yesterday, so I couldn't share the photo until after I shared the gift! 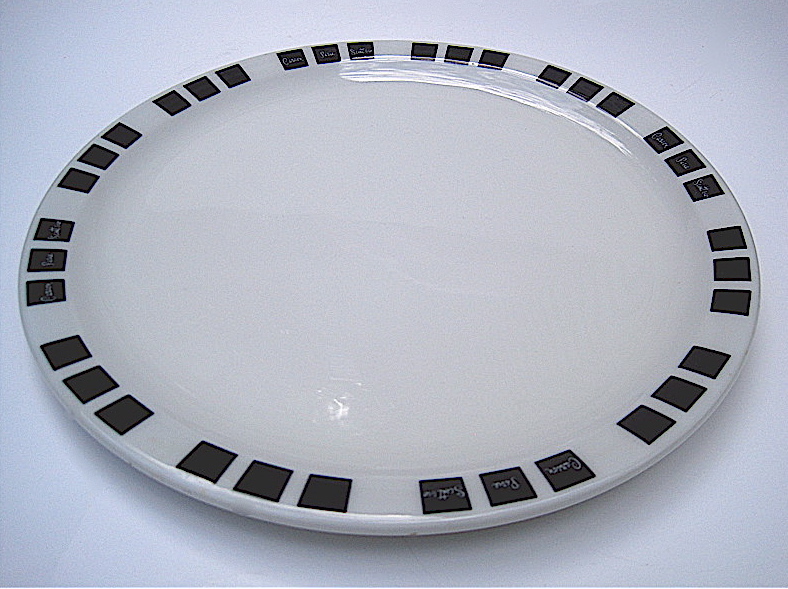 This is only the second time I've come upon such a set, and I find these pieces just the right size for personal noshing. A normal tea and toast set looks a little lonely with just a cookie or two on it. 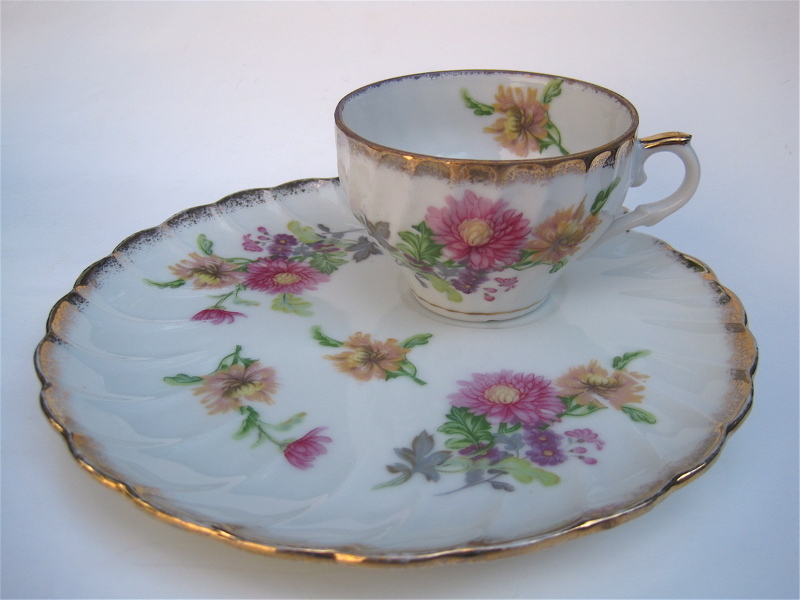 This smaller size set is just right for a small teatime treat—and so very elegant! My friend loves roses just as I do, so I thought this particular tea and biscuit set would be just right for her. 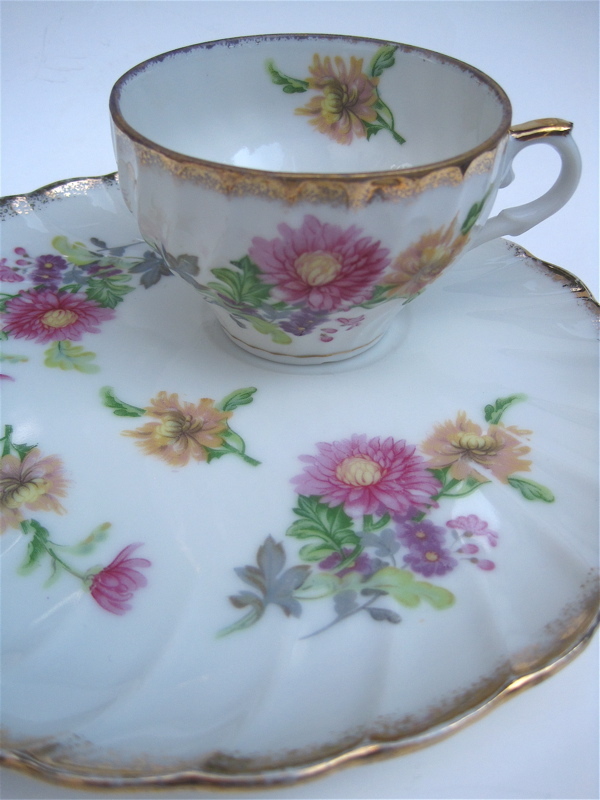 It's marked Windsor Bone China, Made in England, and I trust my friend will enjoy using it as much as I enjoyed finding it! 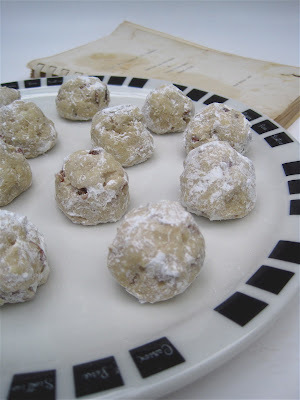 Over the weekend I rediscovered an oldie-but-goodie recipe I'd forgotten about. Perhaps because the Olympics have our thoughts turned London-ward, I had picked up my copy of The National Trust book "Tea-time Recipes" by Jane Pettigrew. 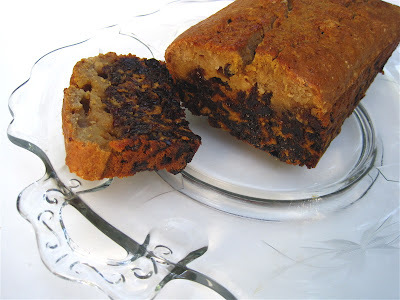 The recipe I used to enjoy years ago was called Fatless Tea Bread, a name I liked because "fatless" sounds so much better than "fat-free" for some reason! 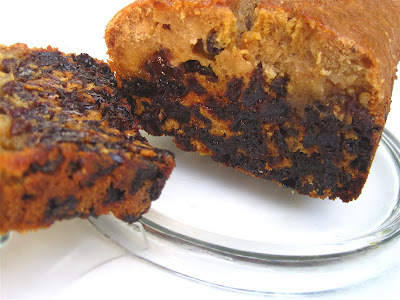 It's really just a good fruitcake-tasting tea bread, so if you don't like that spongey-springy texture of fruitcake, this may not be your cup of you-know-what. 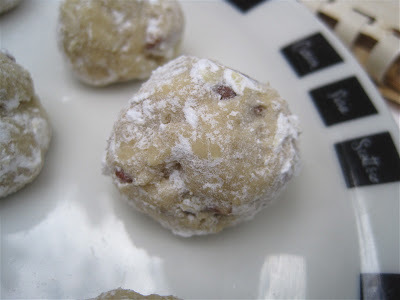 But if you do like fruitcake and those steamed pudding textured desserts, give this a try. The liquid in the batter is cold tea, interestingly enough. Here's the recipe as I made it. Preheat oven to 325 degrees. Grease and line a loaf tin. Combine all ingredients and mix until blended well. Pour into tin and bake for 2 hours (yes, 2 hours!) until a tester comes out clean. Turn onto wire rack to cool. *You know how they say that if you coat the dried fruit with flour, it won't sink in the batter? 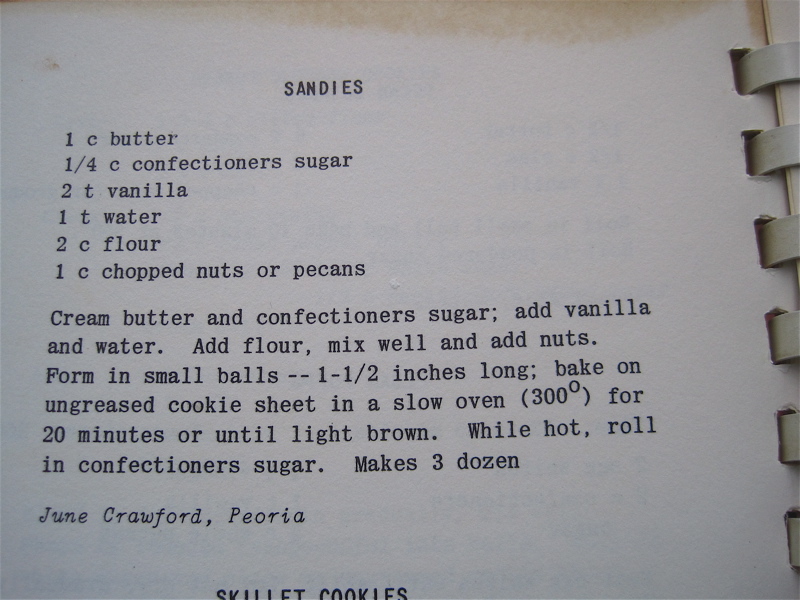 Well, I DO coat the fruit with flour, and in this recipe it still sinks, although that doesn't affect the taste. If someone knows another trick to try, I'm willing! The winner of the teatime notepad from last week is Loralie, so if you'll send me your mailing address via the e-mail button at right, I'll get this headed your way. Congrats! 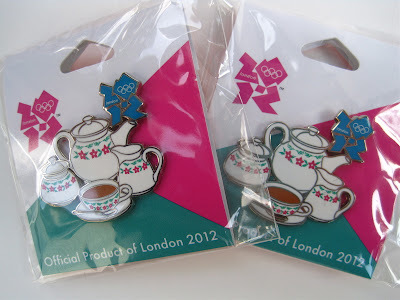 And as you see from the photo above, I have two teatime Olympic pins, one for me and one for a reader of this blog! 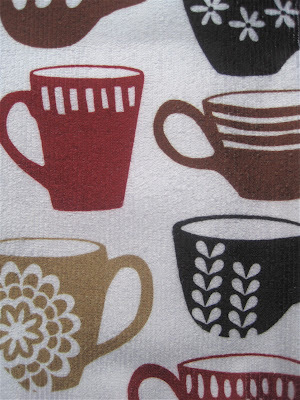 If you read yesterday's post you knew what today's giveaway would be, you just didn't know which design it would be. 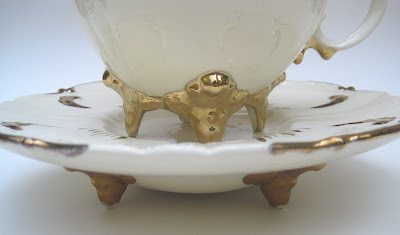 So those of you who guessed The Tea Set Pin yesterday already have one entry in the pot, and now you good guessers along with everyone else get another chance to win by leaving a comment to this post between now and noon EST on Friday, Aug. 3. Good luck! 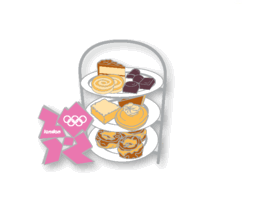 BOM bom BOM bom BOM bom BOM bom ... and I don't know how to express the rest of the tune, but I'm excited about the London Olympic games starting tonight. Are you? As with the last summer games, I have found an official Olympic pin (actually three this time) that seems appropriate for tea-loving Olympics viewers. There are quite a few of these out there, and I'd encourage you to do a search for "tea Olympics pin" if you're curious about all the fun designs, but the three I bought are (and this is important!) 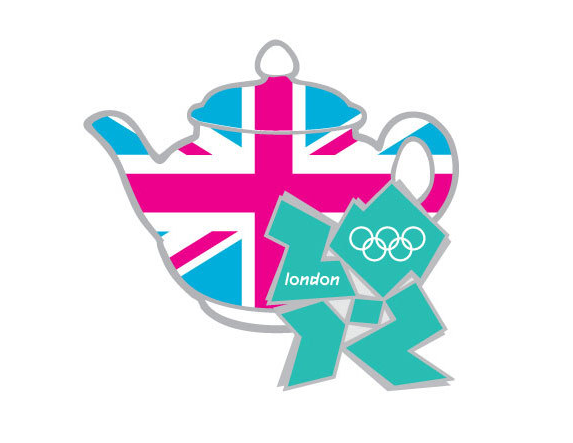 #1) The Union Jack Teapot. and #3 The Tea Set. Now, let's have a little game ourselves. You see, I purchased a duplicate of one of these pin designs, and it will be offered on my Saturday giveaway tomorrow. If you can guess which one it is today, I'll throw your name in the hat a second time if you enter on Saturday! I'll give you a clue: It's my favorite one. 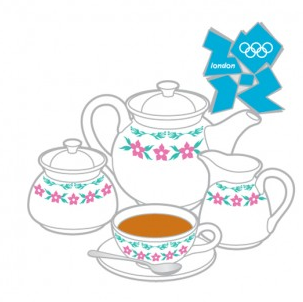 So ... is it #1 The Union Jack Teapot, #2 The Tea Tray or #3 The Tea Set? Let the games begin! 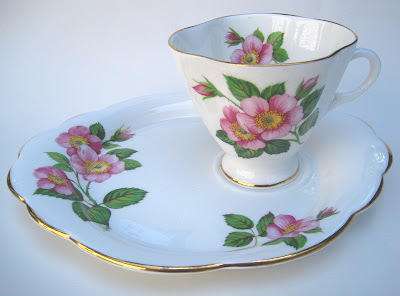 Many of you, I have observed, have teawares for every season of the year. I, sadly, do not. If it's spring or Valentine's Day or anything pink-related I'm all set, but when it comes to fall, I simply haven't found very many pretty things in fall colors and patterns. Until now! 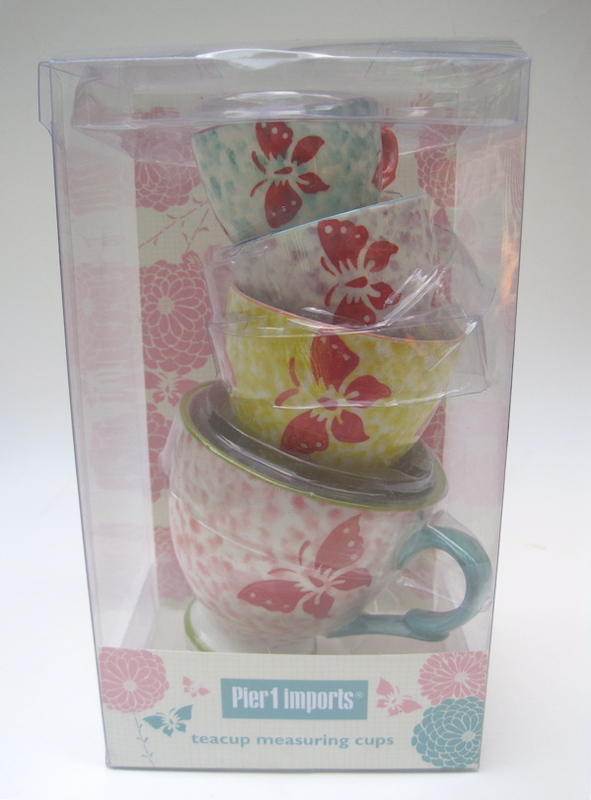 OK, so it's just one measly little tea and toast set. Still, when I came across this set recently I knew I had to have it. Aren't these mums? The gold and mauve colors are *perfect* for fall, which can't get here fast enough. 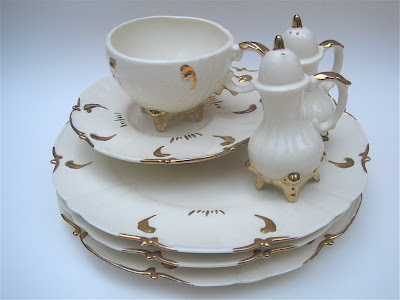 So now, to have enough for a tea party of four, I just need to find three more of these sets. Or really, two and a half, since the seller included an extra cup. 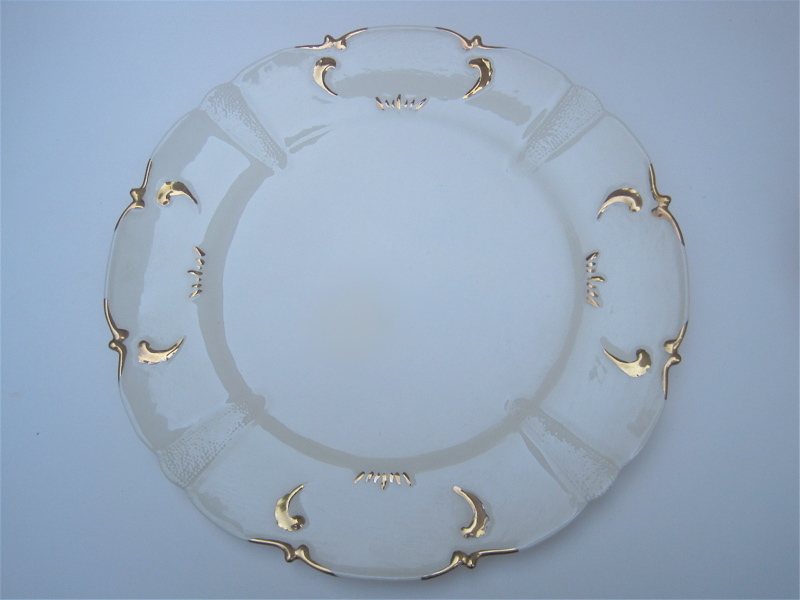 The pieces are unmarked, but I figured if I put the word out, perhaps one of you will spot another of these sets in a shop or online one day and remember me with a shopping alert! Relaxing is my cup of tea! At the office we just sent off the annual newcomers' guide we publish, which is always an exhausting project, so I celebrated by taking the day off yesterday. My first task? Tackling the overflow in my crafts room! 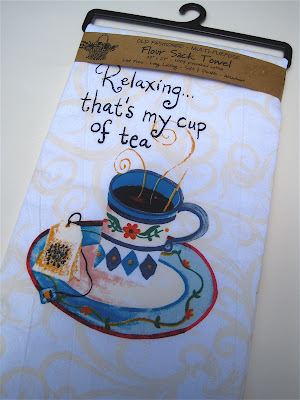 As I did, I stopped to admire something I've had hanging there for a while just because I like to look at it, this cute tea towel from my friend Phyllis. It seemed quite appropriate, because relaxing doesn't necessarily mean reclining on the couch and eating bon-bons. For me, relaxing means getting to focus my mind in a different direction. 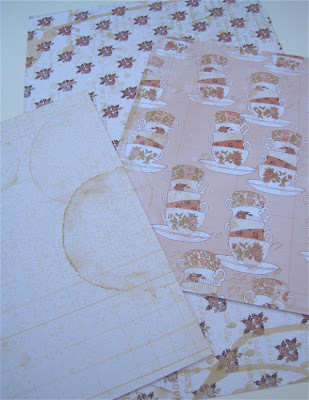 No more deadlines for a few weeks, a chance to catch up on friends' tea blogs (I'm so behind! ), and thinking about going to the beach in a few more weeks. For now, that's my idea of relaxing. What's yours? It's been a while since I've enjoyed a new fruity tea,or "tisane," so I decided it was time to break open the free sample packet of a new tisane that Capital Teas recently sent me along with my order. Isn't this blend pretty? 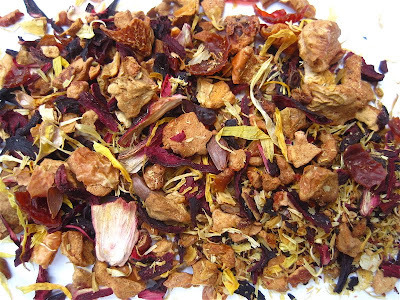 I got a nice whiff of something citrusy and something strawberry-ish when I first opened the Harbor Breeze tea, which the web site tells me is named in honor of Capital Teas' second store at the National Harbor, Maryland. What's in Harbor Breeze? Natural dried apple, hibiscus, rosehip, natural dried orange, calendula petals and natural flavors. When the tea brewed up a rich, deep red color, I was a little fearful this would be one of those blends too tart to enjoy. 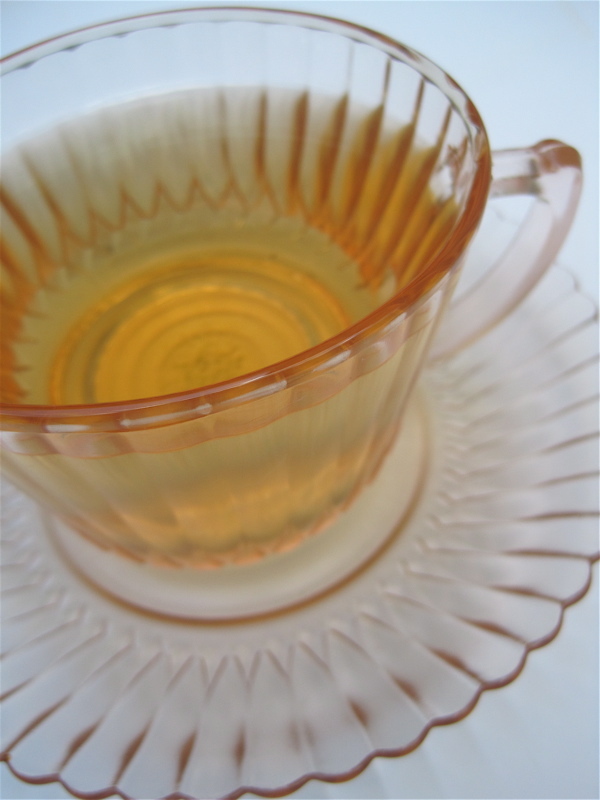 In fact, after steeping it the recommended 8 minutes, I just knew it would be overly tart, but it was not! It was very rich in the fruit flavor, heavy on the berry side of things, but happily this brew did not make me pucker. Oh, and it ices beautifully as well, making this an excellent choice for summertime sipping. Earlier this year, I added to my collection of department store tea room memorabilia by purchasing a postcard showing the Carson Pirie Scott tea room in Chicago and a 1962 cookbook by the Carson Pirie Scott Women's Club. (They are shown here, if you'd like to see them.) 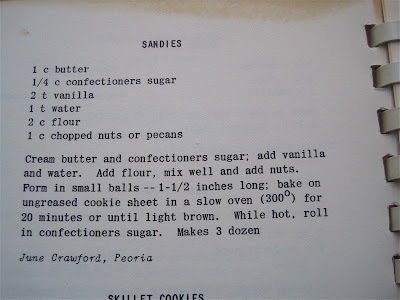 Over the weekend, I decided to try the book's recipe for Sandies, and I must say these were easy and delicious, a perfect teatime treat! 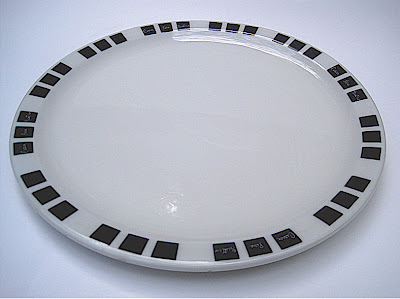 The other reason I wanted to make something from the Carson Pirie Scott Women's Club cookbook was that I recently came across an old piece of restaurant china bearing the store's name. 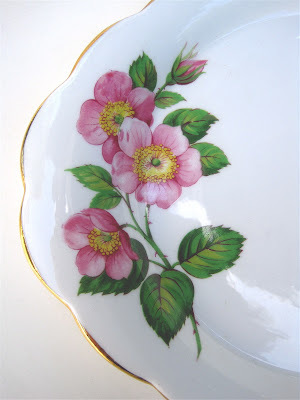 I was so very happy to add this piece to my little collection! And if you're not into department store and/or tea room history, perhaps you can at least use a new cookie recipe? I ate mine warm, fresh out of the oven and freshly rolled in powdered sugar. 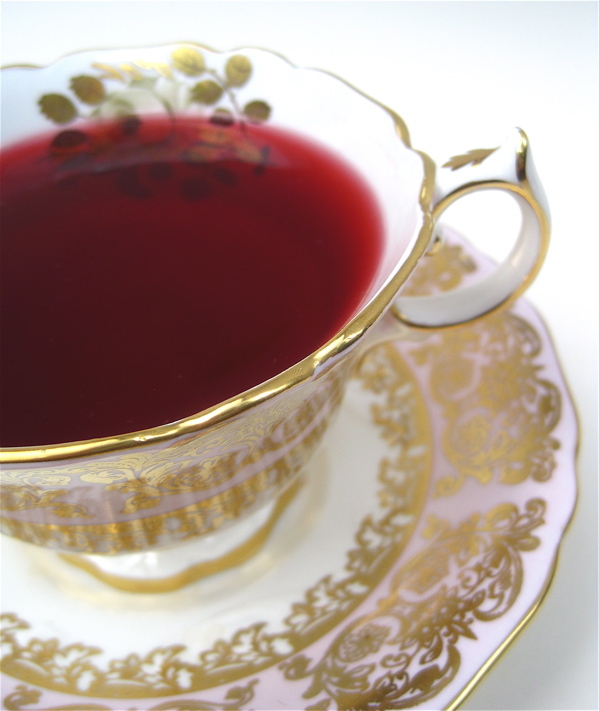 Enjoy slowly, with a nice cup of tea. That's my advice! 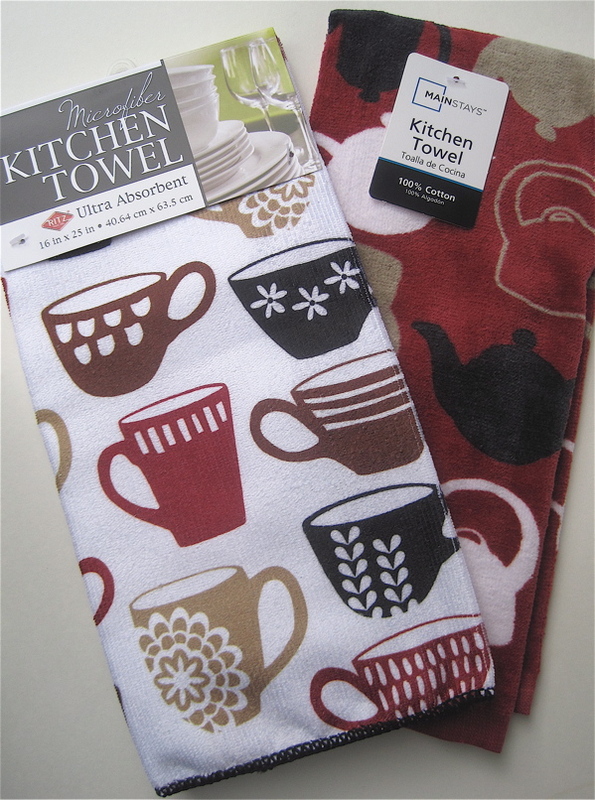 The winner of the tea towels from last week is Marilyn of the Delights of the Heart blog! Congrats, Marilyn, and I'll have these headed your way very shortly! 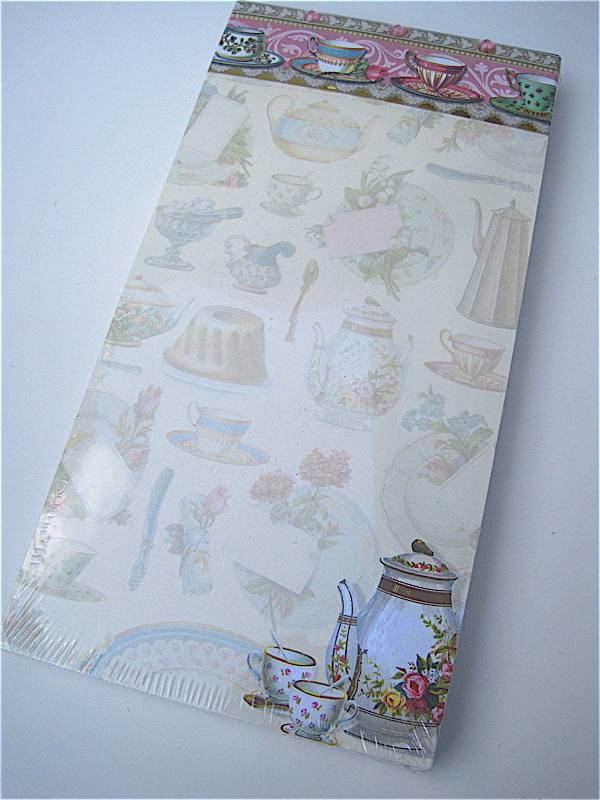 For this week's giveaway, we have a new magnetic notepad with teawares on it. It even has a little rhinestone bling up top! 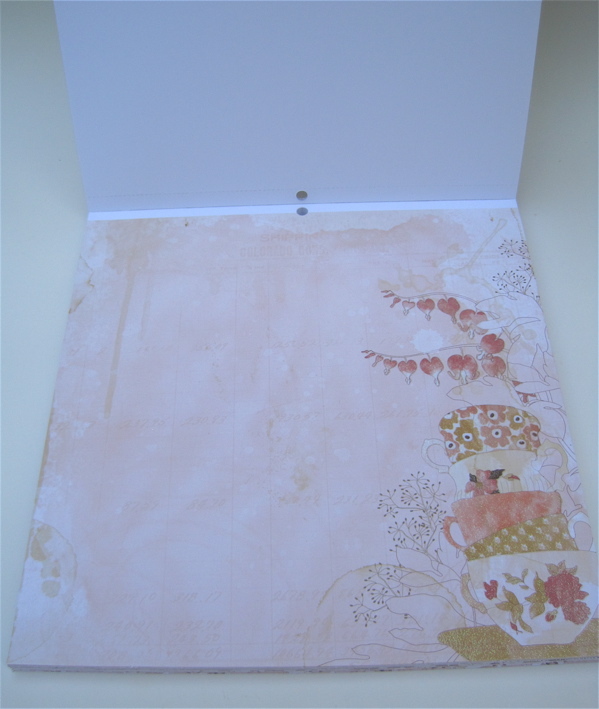 I'd recognize this design anywhere because I've had it on notecards, file folders, a three-ring notebook, a memo pad—and I couldn't resist getting this to share with one of you! If you'd like to win, just leave a comment to this post between now and noon EST on Friday, July 27. Good luck! But enough hair splitting! This new tea is packed with strawberry flavor, has only 5 calories and contains no aspartame. 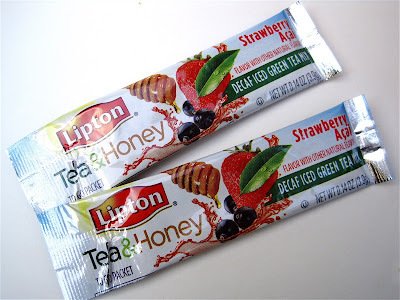 Lipton seems to make the tastiest of the powdered drink mix packets, and I can't imagine they'll ever come out with one I won't be willing to try. If you drink these sorts of teas occasionally, I'd love to hear which flavors you enjoy! A few months ago Teavivre sent me some samples of their teas, and this week I decided to try the White Peony Tea (Bai MuDan). The first thing I noticed when I opened one of the packets was how light and fluffy the loose tea leaves were. Whisper light, I'd say. 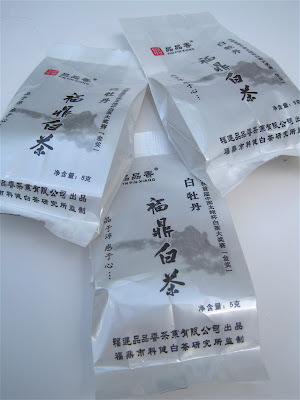 About two servings are packaged in each of these smaller individual white packets, which I imagine helps keep the tea fresh. The scent of the loose tea was that nice woodsy one I so enjoy, like the scent of fresh wood shavings in a woodworker's shop. The flavor? Oh my, this was good! 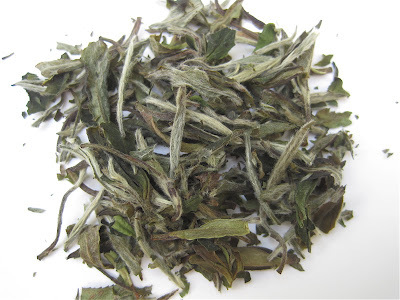 It had a great mouth feel, on the vegetal side of things, with very little astringency. 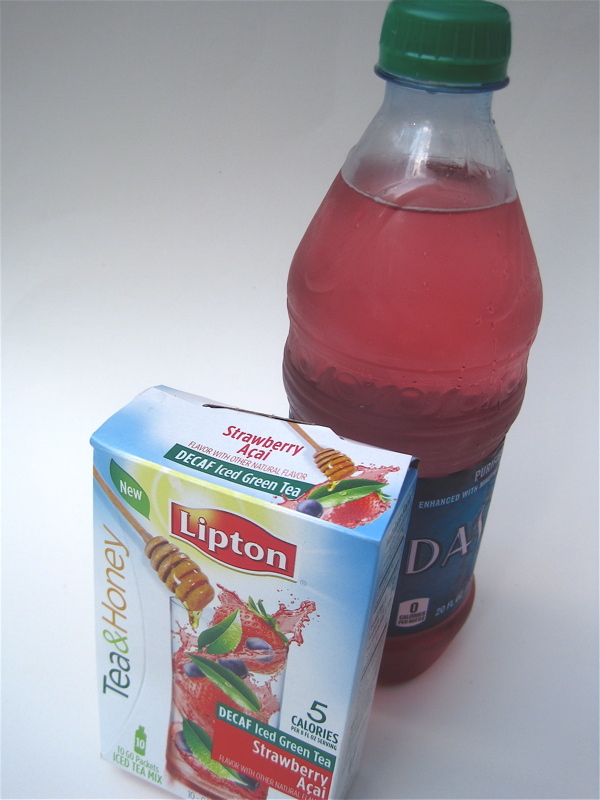 It had a very light, clean quality that struck me as very refreshing—and tasty! 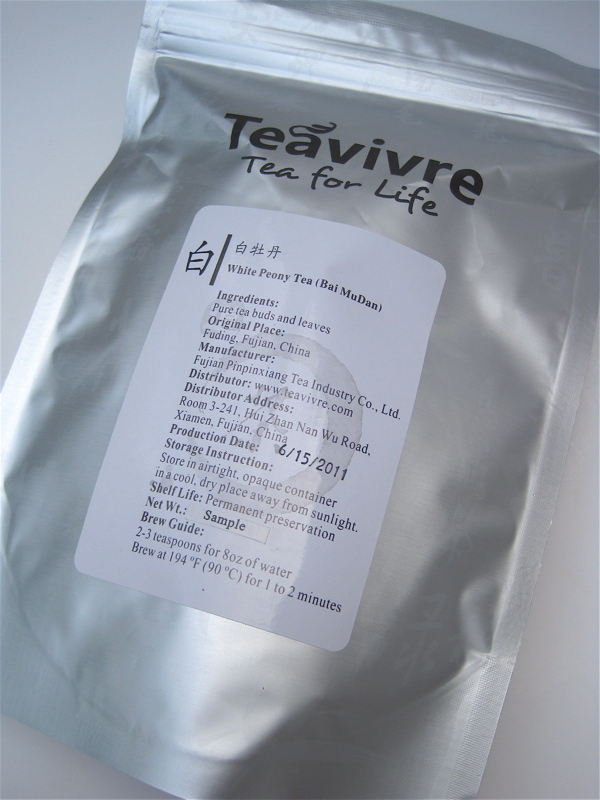 Teavivre's White Peony Tea is definitely a hit with me, and you can read more about it for yourself here. 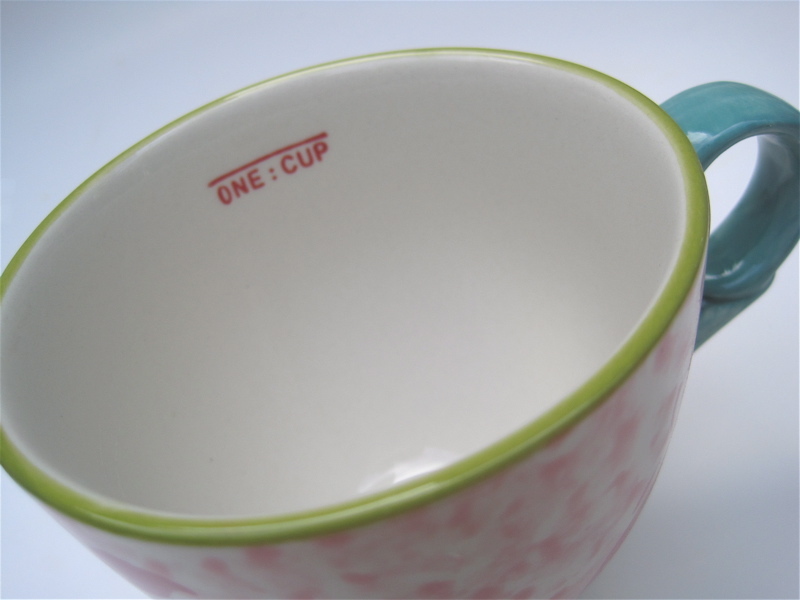 Years ago I came across a set of teacup measuring cups, but I had a friend who I knew would love them so I gave them to her. (She has eight children, so I figured they'd see more use at her house!) 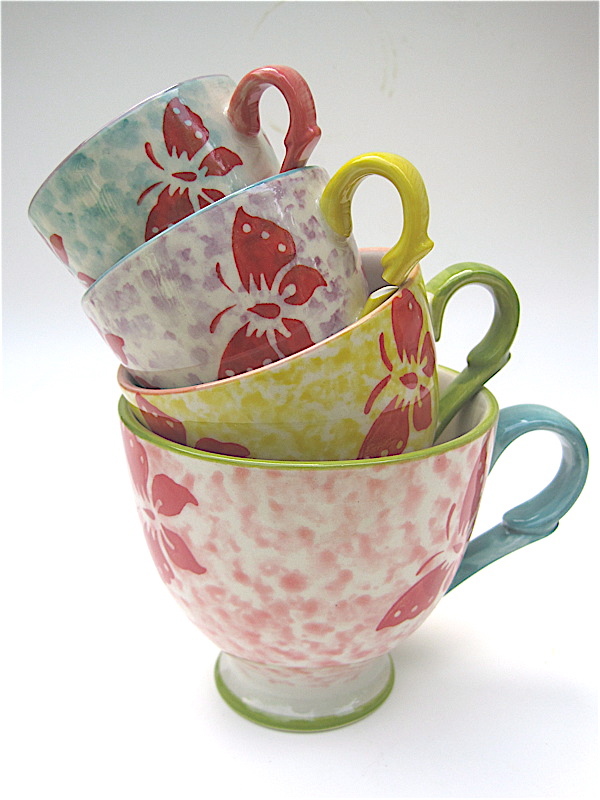 Last week I had a wonderful surprise in my mailbox when Karen in Georgia, a recent giveaway winner, sent me these wonderful new teacup measuring cups! As you can see from the box, they came from Pier 1 Imports. Now that store was not on my "tea radar" as a possible source for tea goodies, but it sure is now! The set includes 1 cup, 1/2 cup, 1/3 cup and 1/4 cup teacups. I will so enjoy using these in the days ahead. Thanks again, Karen, for the delightful gift! There is a tea quote I particularly love which goes like this: "Bread and water can so easily be toast and tea." 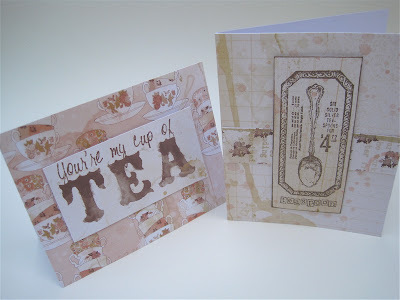 Those of us who enjoy the pleasures of teatime know that is quite true. 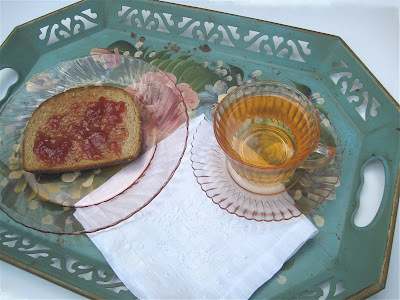 Over the weekend I set a tea tray just for me, with a simple slice of whole wheat bread with butter and strawberry jam, served with a cup of White Peony Tea. Takes not five minutes to assemble, and yet it feels sort of ... special ... doesn't it? Years ago I collected old toleware trays like this one. Some in better shape, some not so much, but I loved them all. 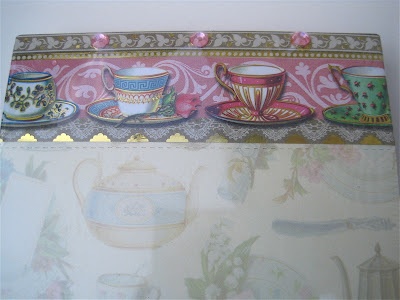 In fact, before I married I had my kitchen decorated with them. 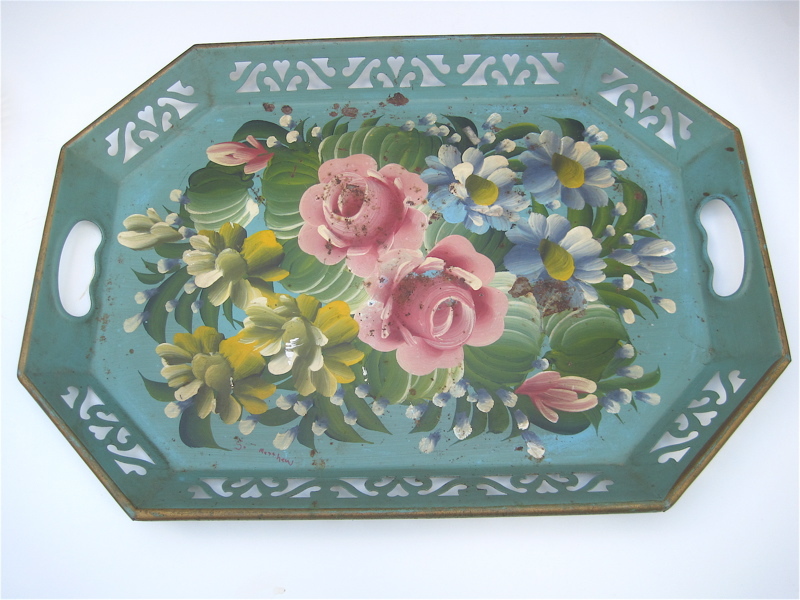 I don't think any of my tole trays cost more than a few dollars, so I continue to be stunned when I see them in antique malls for the going rate of $50 and up, even for some of the spotty looking ones. My mom (you're not surprised) found this one for me last week. "Do you think that tray was worth 50 cents?" she asked. Yes, yes I sure do! 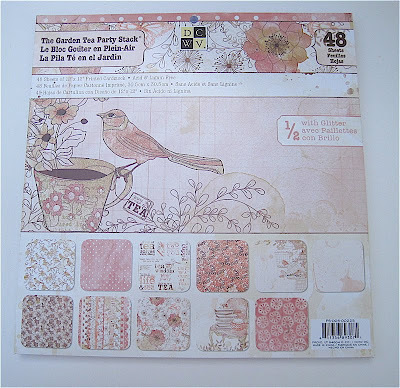 Several months ago when I got back into rubber stamping, I began looking in craft stores and online for some tea-themed scrapbooking papers. To my surprise, the offerings were pretty slim. 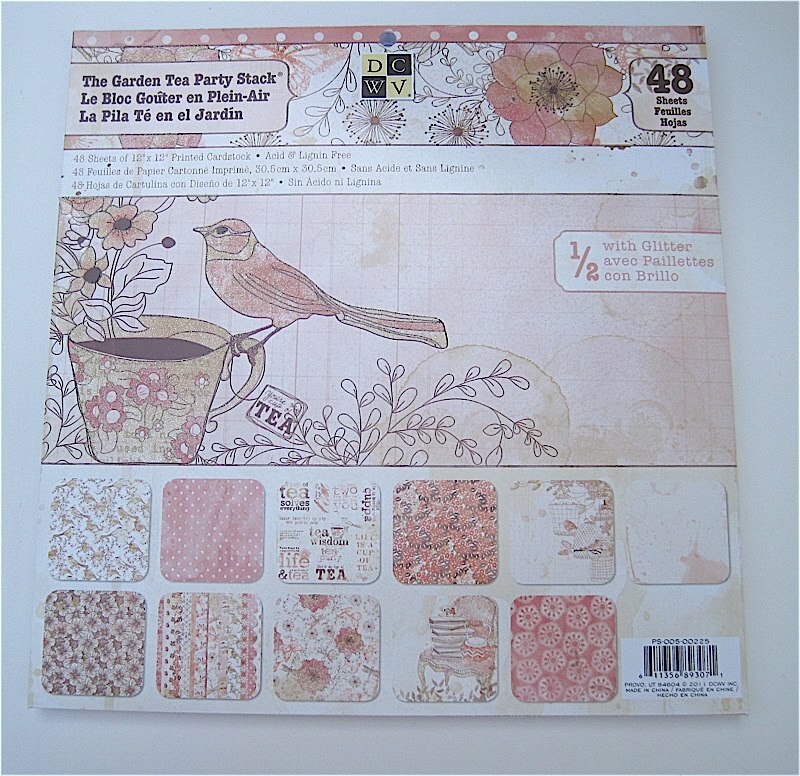 One eBay seller was selling some pretty tea-themed single sheets for a few bucks each, and a little research revealed the sheets came from DCWV's new Garden Tea Party Stack of 48 papers, two each of 24 different designs. I looked online as well as at Michaels, Hobby Lobby and JoAnn and could not find this stack anywhere. In fact, I forgot about it and gave up—temporarily—on the search. 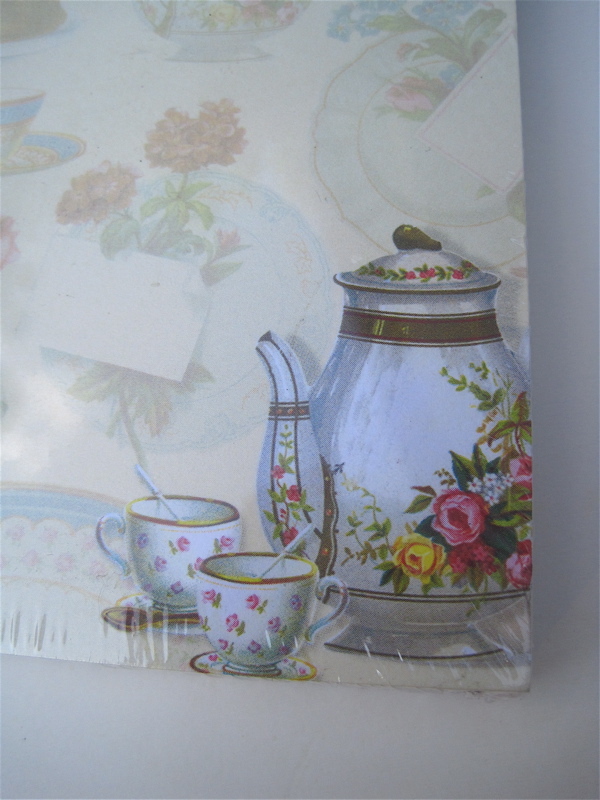 Friends, I am happy to report that it's time to pull out those 40 percent off Michaels coupons, for the Garden Tea Party Stack has now arrived at Michaels–or at least my local Michaels! Happily, I didn't even have to use my 40 percent off coupon on this because it was already on sale. 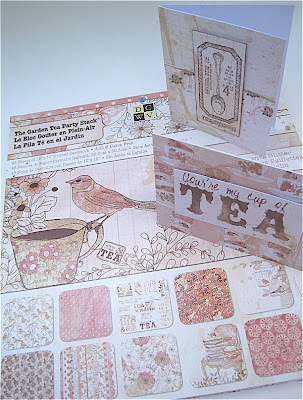 Now whether you're a stamper/scrapper or not, there is much to love about this stack. 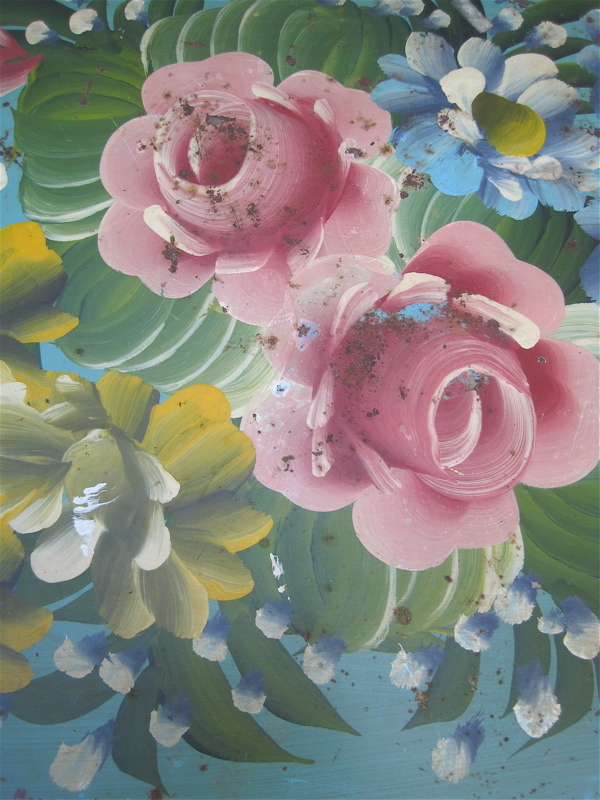 In addition to teapots, teacups, flowers and birds galore, some of the papers have tea "stains" on them, which gives them sort of an edgy/contemporary vibe. There are also full sheets that would be perfect for scrapbooking as well as for invitations and signage for tea parties. 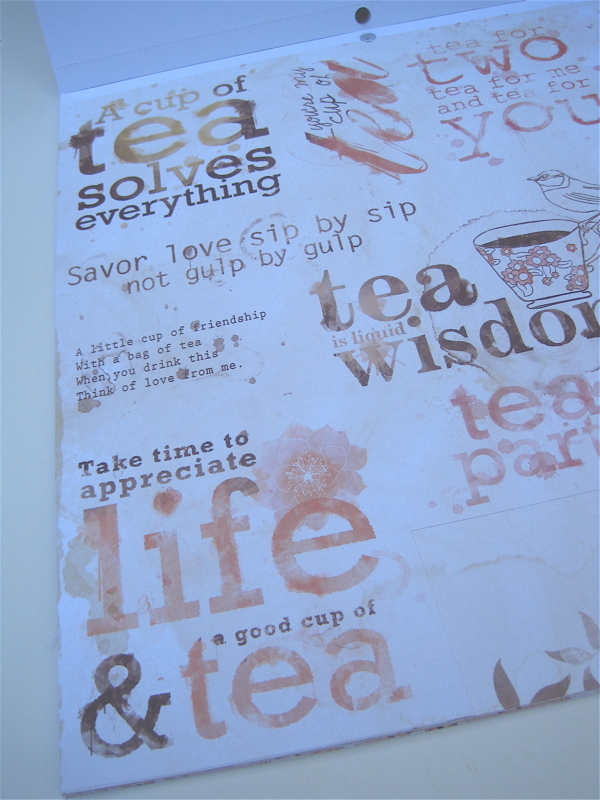 Another of my favorite pages in this stack is this page with lots of tea quotes. 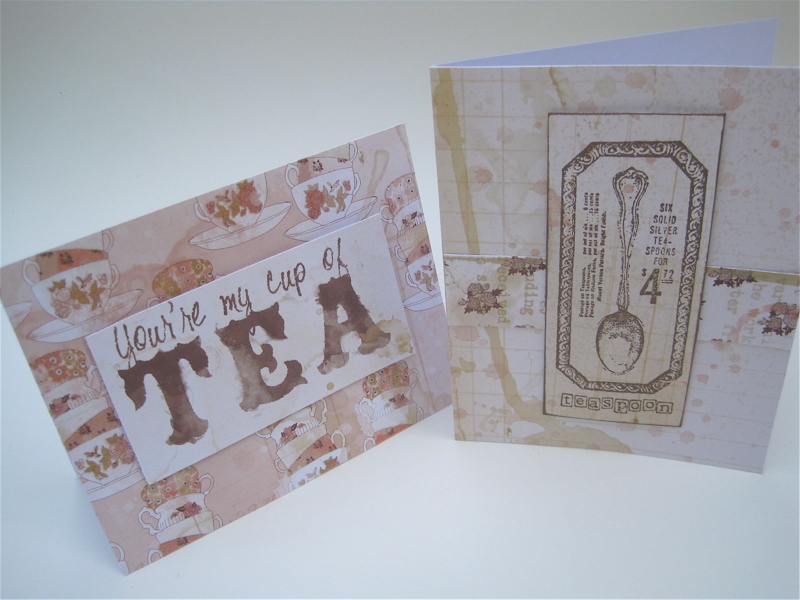 I used one of them to make the very quick and simple card at left, and I used a teaspoon stamp my friend Lynn gave me to accent the card at right. This stacks retails for $19.99, but watch the sales or use a coupon and get it for just $12. I'm already thinking I may need to go back for another! 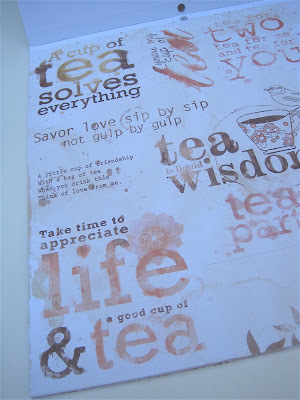 The winner of the "Tea Shirt" from last week is ParTea Lady, so congrats! I'll have it headed your way very shortly! And this week's giveaway is something surely everyone can use, a pair of tea-themed dish towels. I found these at Walmart this week and thought they were really cute. These two aren't actually a set, but the colors blended well so I got 'em both. Especially for "everyday" use, I enjoy having dish towels with contemporary designs of teacups and teapots and tea kettles. Perhaps you do as well? If you'd like to win these for yourself, just leave a comment to this post between now and noon EST on Friday, July 20. Good luck! 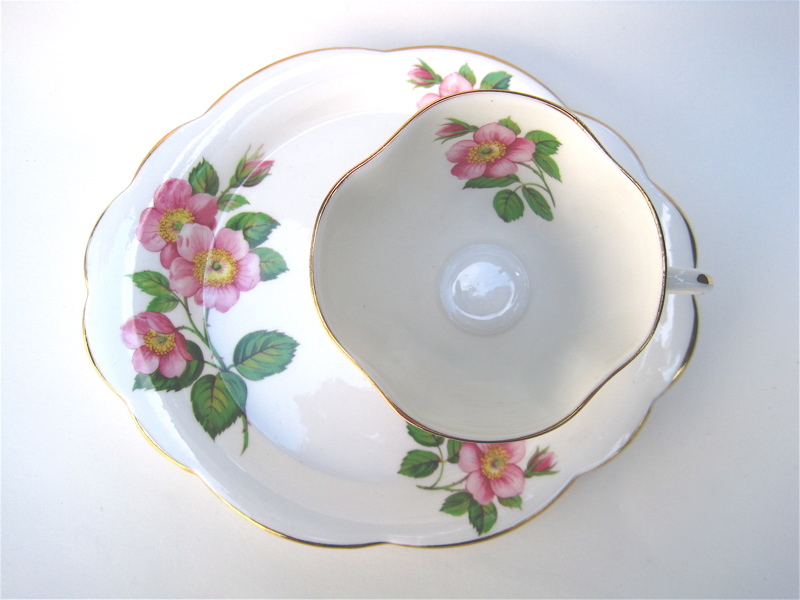 If only teawares could talk! A friend's family was cleaning out some rental property and came across some dishes my friend *almost* threw away, but then she thought of me and called to see if I wanted them. 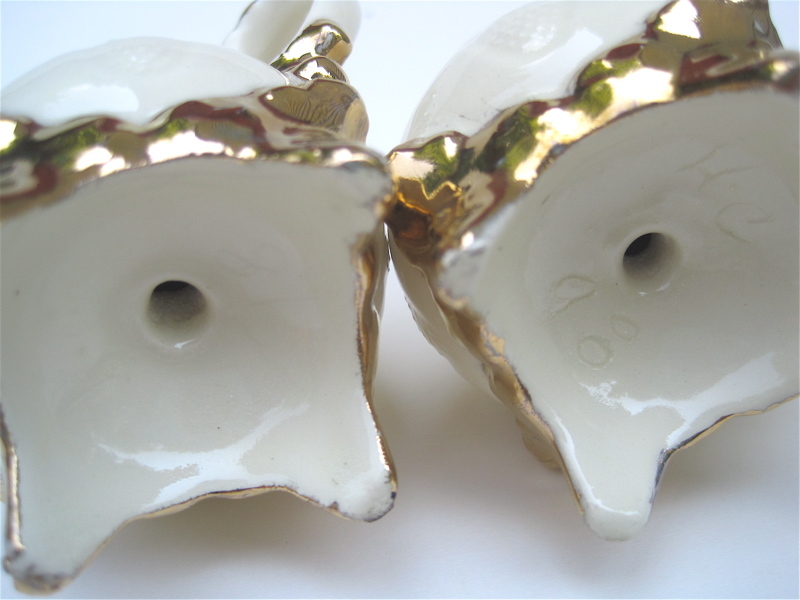 Of course I said yes, out of curiosity if nothing else, and I must say I found these pieces quite charming in a rough-edged kind of way! 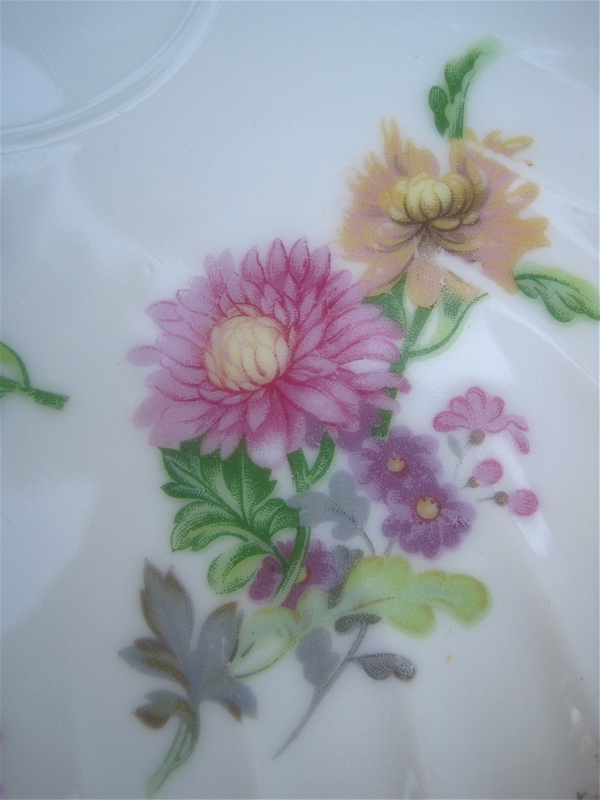 I do believe these are handmade ceramics—do you agree?—as all these pieces are marked "HC 98" on back. I wonder who made them. Hillary Clinton? Howard Cosell? (Actually, he had died in 1995, so no.) Harry Connick Jr.? Kinda fun to imagine them firing up some ceramics, isn't it! 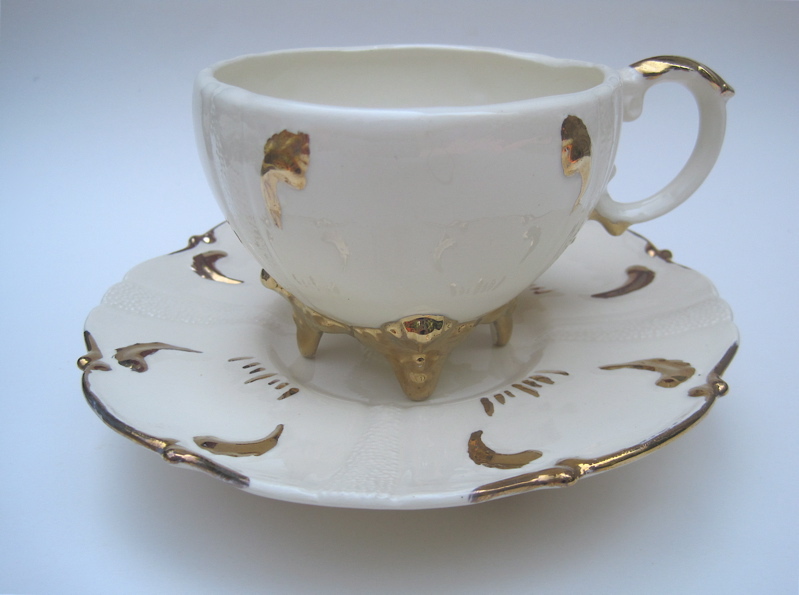 Here is the teacup and saucer set. Interestingly, both the teacup and saucer are footed. Does that make this set double-footed? Is there a term for that? 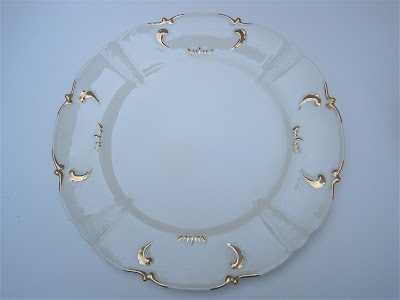 The plates are nice and simple, and I can see these used at, say, Christmas, in a three-tiered rack as serving plates. ... 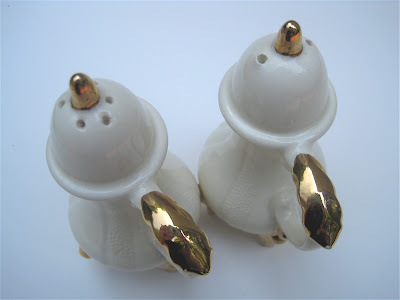 I asked my friend, "How do you get the salt and pepper in those little holes?" She just shook her head and grinned at me like, "That's YOUR problem!" But you know what? 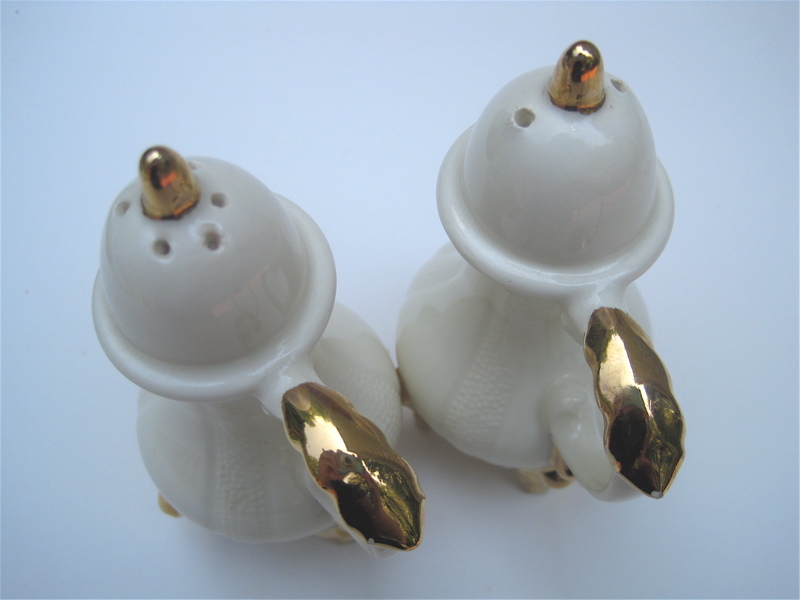 I have used old salt and pepper shakers as ornaments on my tea-themed Christmas tree before, and I do believe I'll do the same with these!